JARED COOK IS A SAINT!! Saints always have the same process to compliment the free agency/and/the college draft. The main objective is to sign as many contracts to fill current roster 1st. Sean Payton, the head coach of the Saints and the rest of the league administration is in hot pursuit to seek a change! Change is good!! defining moments of the big play maker in Michael Thomas has not been in one or two or three games during the 2018 Saints season. It is a trait in every game! La Veaux Carre-The French Quarter, is the home of the Saints fan base since 1967. We appreciate all other fans around the country and the world abound as much! This guy is bad news! First, he cheated his way into the Super bowl...and then, continued the same brutal violence in the Super Bowl game, both games of which costed him nearly 60,000. PLAYERS react to fan support on S.B. Sunday. Drew Brees said we're the best fans in the world. I tweeted him back- it's because we have the best team to root for! This is the second year in a row that the Saints have been ranked number 1 by the NFL. This is the highest honor, over all... that a team can earn out of 32 teams! NEVER UNDERESTIMATE WHAT A GROUP OF CITIZENS CAN DO! Lots of videos of thousands !!! An awesome video of the reality that surrounds the team and coaches and the owners and family. The road less traveled in the football world! An incredible journey. A number of Saints were honored at the Atlanta Awards Show in Atlanta on Saturday February 2nd. Watch his awesome expertise, chemistry with receivers! Watch him receive the all time best passer of the NFL award with nearly 75,000 yards passing the leagues #1. Kamara and Bush takes the Saints Challenge! The two headed running back team for the Saints talk on a show with Dion Sanders and others. About their running game, on Super Bowl Prime. Check out the video on a talk show with Alvin Kamara and Emitt Smith and others. This is a live broadcast on national television and he is one of the talk show hosts. See and hear the Defensive end for the Saints who had a big season 2018-19. THANK YOU FROM Mrs. B. This is a thank you letter to the Saints fans...from Mrs. Gayle Benson. The sincerity shines through and she knows we are there for The Saints!! THE SAINTS WERE ROBBED OF A SUPER BOWL--BITE BACK!! I mean where not...to watch the S.B.(B.S.) --equal degrade..
His T-Shirt says it all !!! Short and sweet. The NFL referees could not watch the replays after they crippled the Saints from going to the Super Bowl! Mike Triplett discusses the "no call" ! And where the Saints and the city of New Orleans goes from here. Drew Brees and Alvin Kamara thanks the Saints fans! Live video. Here are the pics of the Saints pro-bowlers selected to play in the pro-bowl. 30,000 dollars- a concussion type helmet to helmet hit by the nickle defender of the Rams near the goal, 1:48 to play regular game time. A game changing-"no call." *BYU fans heckle Referee Vinovich over the "NO CALL" in the Rams/Saints championship. This was at a basketball game. LOL! Thomas Morstead(punter), was given the special teams player of the year award! HELL OF A GREAT DEFENSE!! The Saints Defense turned out to be one of the best in the league! They started out the worse! What an improved team through the season. They deserve to be noticed! VIDEO JUST POSTED THIS AFTERNOON. MAX-former center for the Seahawkes has brought to the table a well 'centered' o-line for the New Orleans Saints. No pun intended! Yes it is a significant reason the Saints won the first playoff and advances to the NFC CHAMPIONSHIP! Brees excellence never ceases to amaze me! He is #1-the best. Lattimore's interception of the intended receiver--Ertz, was the turning point of the game in favor of the Saints come back.The Saints were down 14 to 0-1st quarter. This Sunday-we need the defense of the Saints to show up playing like they did against the last three quarters of The Eagles game. 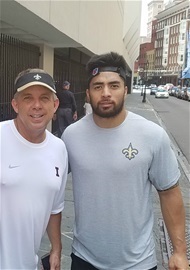 This is a page from www.neworleanssaints.com which is called--MORNING BREAK. It has a number of pages you can pull up from it. They are all very interesting reads. SAINTS PLAY-OFF ROSTER HEADING INTO THIS YEARS PLAY-OFF 2018-19. THE SAINTS WILL NEED TO BE AT THEIR BEST LEVEL OF PERFORMANCE IN ALL THREE FACETS OF THE GAME, OFFENSE, DEFENSE, AND SPECIAL TEAMS--IN ORDER TO WIN!! BEST OF SAINTS OFFENSE/V. EAGLES--PHOTO GALLERY. Earlier in the regular season. See the Saintsations pics here! 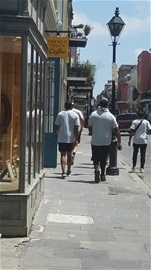 Some of the Saints players took a tour on foot in the French Quarter in the off season before the pre-season of 2018. HOLIDAY PHOTO SHOOT OF SAINTSATIONS. SEE SAINTS FANS AT CHAMPION SQUARE--GETTING UP FOR THE POST SEASON PLAYOFFS!! THE BEST OF THE ROAD PICS OF THE NEW ORLEANS SAINTS GAMES/PLAYERS. Mark Ingram passes Reggie Bush and Duece McAllister in rushing yards! HOW TO WATCH THE SAINTS AND THE RAMS THIS COMING SUNDAY! My take is the Saints will be at their very best... This is well worth watching. And ... every aspect of it!! cHEER US ON jOLEY !! FEEL THE EXCITEMENT AROUND THIS NFC CHAMPIONSHIP GAME AND AROUND NEW ORLEANS!